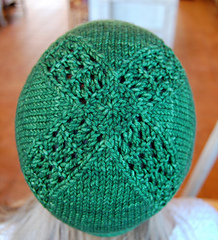 This hat features 4 panels of alternating eyelets separated by stockinette panels that taper to a point at the crown. Any way the wind blows-north, south, east or west-this hat will keep you warm and looking good while doing so. Also available as part of the Point/Counterpoint, Volume 2, collection. Two designers + two yarns = inspiration through collaboration. Each designer independently created an accessory, then sent only a photo of the finished object to the other. In response, the designers used the same yarn to create a new accessory inspired by the first, thus making a set. The only limit was their creativity! 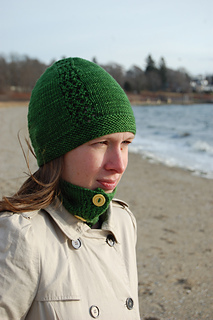 Knit to go with the Lean Into the Wind neckwarmer by Kino Knits, also available in the collection.